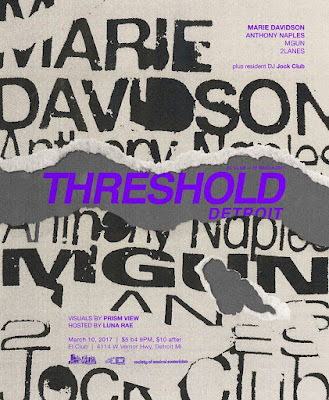 Threshold Detroit will once again be taking over El Club this weekend! They will be bringing some great electronic artists to the stage along with visuals by Prism View to add to the show. The lineup for the evening includes MARIE DAVIDSON, ANTHONY NAPLES, MGUN, JOCK CLUB and 2LANES. Check out this music video from Marie Davidson and get a feel for what the night will be like. Admission for this show is only $5 if you get there early and there will be drink specials. After 10 p.m. the price goes up to $10. Thanks to Party Store Productions, we are also giving away a pair of tickets to this show. If you would like to enter to win, send your full name to hipindetroit@gmail.com with #threshold in the subject line. We will draw one lucky winner on Friday morning and they will get into El Club for free that night. All ages are welcome to attend this event. For more info, click here.